Managing an ecommerce shop requires staying current on a variety of topics. Sometimes it can be overwhelming to stay up to date on orders, stock, questions, comments, security, and content management. With the help of useful tools built for your ecommerce system, you can setup your website to make important data more accessible. With some strategy, the information you used to hunt for will find its way to you. We will mostly be exploring WordPress and Woocommerce, but the benefits are applicable to all ecommerce websites. The first thing seen when logging into your ecommerce website is the dashboard, and you can use that to your advantage. 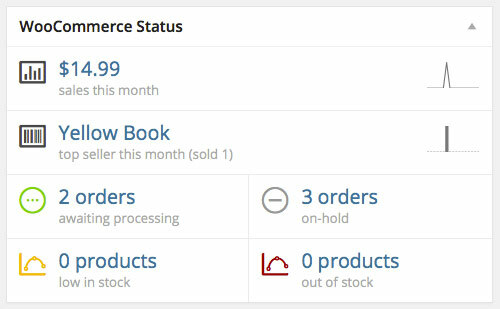 Setup the dashboard using ecommerce widgets to get an overview of your online stores activity. Identify new orders, evaluate product stock, check for broken links, and read customer comments. Customizing your dashboard will help you evaluate your shop activity and prioritize urgent tasks. Stay connected to your online shop with mobile push notifications. This is a convenient way to be aware of time relevant information like new orders, low stock, and client inquiries. Let the most important ecommerce information come directly to your phone, so you can manage your business while on the go. This solution helps relieve the urge to constantly check the status of your website. It is important to evaluate if customers are abandoning their purchase before completing the checkout process. Using cart report software, you can receive data on open and abandoned shopping carts. Cart reports can store cart contents, cart conversions, and save personal information if entered in the checkout. By evaluating your customer’s shopping habits, you can identify potential user experience issues which encourage customers to resist completing a purchase. Optimizing the shopping experience can increase sales by minimizing reasons to leave. Customer service is an important aspect of running an online store. Listening to customer questions and comments can be insightful for improving the user experience. Put yourself in their position, and identify important information your customers would like to know. For example, if a product is out of stock, provide a notice informing customers when the product will be available again. Read customer comments, and try to engage the topic publicly within the comments section. Listen to customer opinions, and make sure they are aware of being heard. The same urgency applies to inquiries through your contact form or email. Show everyone that you are human, personable and understanding. All the hard work put into your website is at risk if you don’t make frequent backups. Don’t risk losing everything when the solution is so simple. There are a couple of ways to backup your website. You can backup your website on the server using server management tools. You can also create a downloadable file for a local storage backup with software like Duplicator. The websites we host are automatically backed up to ensure websites are secure and restorable at a moment’s notice. To celebrate our ecommerce management skills, let’s all go backup our website right now!